Shaking up the Scottish Cocktail Scene — Beetle Juice | The original VW cocktail bar - we bring the party to you! Earlier this year we welcomed our newest franchisee Sameer Dhumale to our growing Portfolio; he is our go-to cocktail guy in the North bringing the Beetle Juice vibe to the people of Scotland. Sameer has enjoyed a non-stop, action- packed summer with his van Bonnie and is looking forward to many a more festival and party in 2019. 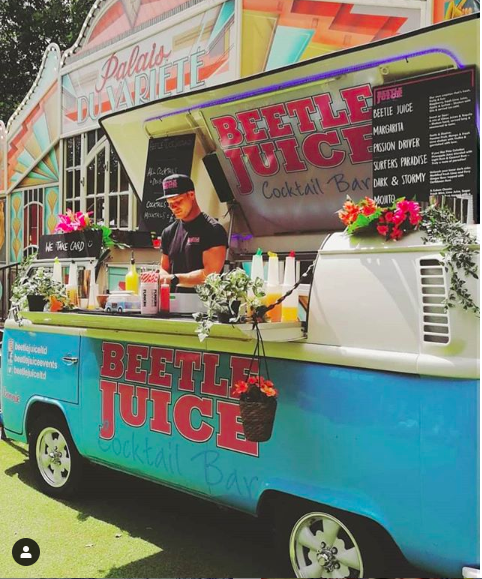 Sameer is not new to the world of cocktail making and cocktail shaking, his brother Ranjit has been with Beetle Juice since 2013 and having worked with each other at festivals, events and weddings over the years, Sameer decided it was time to get his own van. Sameer comments “I had so much fun flying down to help Ranjit at events that I caught the Beetle Juice bug, once he mentioned that Beetle Juice wanted to break into Scotland, I jumped at the opportunity. For my day job I am an Anatomy Lecturer at Edinburgh University where I mostly teach medical students and postgraduate Anatomy students - I love the variability between the two positions; the lecturing is pretty serious whilst the business allows me to get out of Edinburgh, meet interesting people and build something of my own. To manage both I set the evenings and weekends aside for restocking and finding new business, as well as doing what we do best, bringing the party to the people! I have enjoyed attending lots of wedding fayres and venue open days just to get the name out there and show people what we do. We’ve had a great first summer operating at a variety of great events such as VIP at TRNSMT, Bruno Mars and Dua Lipa, Edinburgh Food Festival, The British Street Food Awards and Volksfling - now I am looking to build on this and hopefully set up for an even bigger 2019. I would love to be at The Fringe next year so I am currently exploring opportunities to make it happen". A well-made Mojito - current close second is a southern Mule! Which festival has been the highlight for you so far? TRNSMT hands down- it's in Glasgow and is Scotland’s biggest festival. It took place over two weekends on Glasgow Green at the end of June and beginning of July. I loved everything about it from the music, the weather, the people - it was just insane. We will definitely be back next year. He says: "It's definitely cocktail weather"
Beetle Juice is constantly changing their cocktail service at festivals and events, becoming the UK's premium cocktail option at some of the biggest festivals in the country. Our cocktails are hand-made to order and always with a 50ml measure. Yes, they take a little longer to make but they’re garnished well and we’re passionate about fresh ingredients and our premium spirits. We’re confident you can taste the difference!